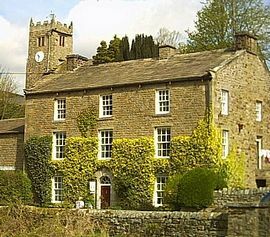 Bridge House Bed and Breakfast is set in the picturesque village of Muker in the Yorkshire Dales, come and enjoy the surroundings that Swaledale and Muker have to offer. There are easy rambles across the meadows, or try the Coast to Coast, Pennine Way, or Herriot Way close by; castles, museums, cafes and craft shops, whatever your choice, we are sure your stay with us will be memorable and enjoyable. Muker is the ultimate location for anyone wishing to get away from it all; there's no mobile phone signal in the village, so, if absolute quiet, with just sheep as background noise, sounds like your idyll, you've come to the right place. Built in the 1800's Bridge House is a family home; an imposing grand Georgian style on the outside and a surprising informal oasis on the inside. 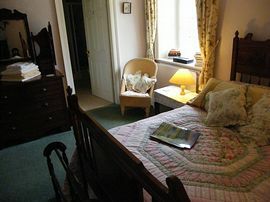 There's three spacious, comfortable rooms on the top floor, with sofas or chairs to admire the views of Muker and the surrounding Swaledale countryside. Visitors often comment how peaceful our home is and how refreshed they feel after a visit. Feel free to relax and unwind in front of the open fire in our sitting room; bring a bottle of wine and stretch out with our books, magazines, or a game from the amply stocked cupboard. Good food is available locally lunchtime and evenings at the Farmers Arms pub; Muker village also has a tea room, gallery, craft shop, Swaledale Woollens and St Marys Church (always open for visitors) - all are within a two minute stroll from Bridge House. Our ground floor breakfast room has a cosy log burner, where a hearty breakfast of local produce and home-made bread is served. There's special offers on all year round, depending how long you want to stay and you can also book the whole house for groups of friends or family. Our latest venture is to offer an Ofsted Registered Walkers Creche, to whole house bookings, of two or more nights - special rates do apply. Spacious rooms furnished individually to feel like home. Good quality mattress and bed for a sound nights sleep. Special Diets Provision: Special diets are catered for. Vegetarians and exclusion diets. Over Great Shunner Fell from Hawes. 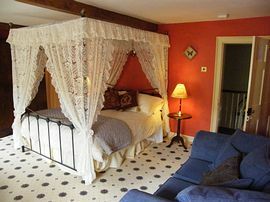 six nights + £55.00 per night. six nights + £55 per night. five nights + £55 per night. 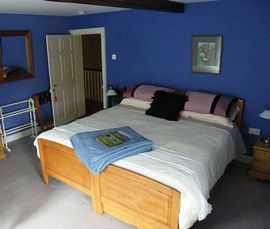 There is an extra superking size room available at £55 per night. This room connects via a bathroom to the superking size room. Open All Year, except Christmas. Our website lists exact dates, for 2008 - we will be closed on 23rd for the village celebrations and re-open again on Boxing Day.